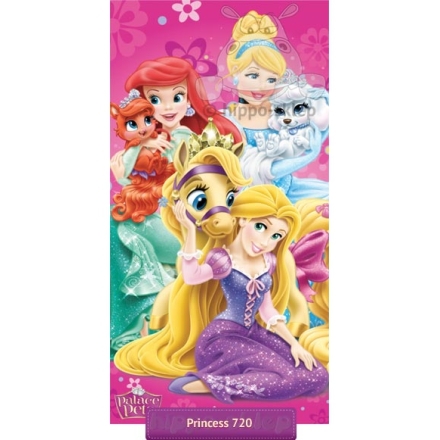 Beach towel Disney Princess and palace pets with Cinderella and her white Poodle dog Pumpkin, Ariel – Princess of Ocean and her scarlet kitten Treasure and Rapunzel with her pony Blondie. 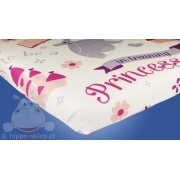 Large kids beach towel with Princess and Pets in pink colors size 70x140 cm, made under license and from official Disney Princess Palace Pets merchandise, from 100% cotton one-side velour finish and printed. 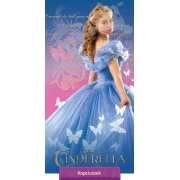 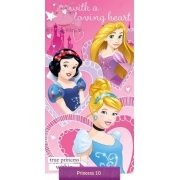 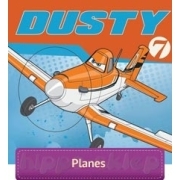 Disney Princess and palace pets towel suitable for home and outdoor use mostly on the water and swimming pool.